New Brand Launches Ready Meals for Tots – With Exotic Twist! Mums! Listen up! If you haven’t already heard, there’s a new food brand on the horizon that is set to take the ready meal market by storm. Mini nom nom’s is a healthy world food brand for kids and grown-ups. It’s just launched and its range of food is inspired by exotic locations and authentic cuisines from around the world. If you’re looking for a way to diversify your tot’s palate, this could be it! The brand aims to break ready meal boundaries with meals that aren’t processed but instead have the essence of home cooking in every bite, and under the guidance of culinary spice expert Emma Grazette, co-author and star, of book and TV Programme, “Spice Trip” Mini nom nom’s is off to a good start! With no added sugar, salt, additives or preservatives, the authentic dishes are made with at least one of the five-a-day recommended fruit and vegetables and in some cases more than one. Every dish in the range has been expertly crafted with child friendly spices and quality ingredients. The five meals in the range inspired from world food include the Tiny Tagine from Morocco, the Little Laksa from Malaysia, the Tiny Thali from Southern India and two Tiny Tiffins from Northern India. 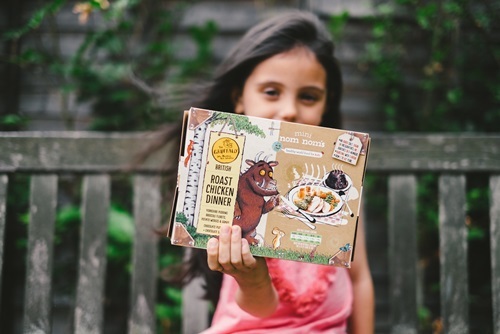 And the brand has just launched a Gruffalo British Roast Chicken Dinner – the free range roast chicken comes with Yorkshire pudding, broccoli florets, sweet potato wedges and gravy. As if that wasn’t enough, there is also a delicious dessert of chocolate pudding and chocolate sauce to tuck into afterwards. Visit Mininomnoms.com (http://mininomnoms.com/) for more info on these delicious ready meals! The 20 Best Books for 5 and 6-Year-OldsFamily Holidays Spoilt by Work-obsessed Parents!